Oil and Gas Well Investments - What you need to know! 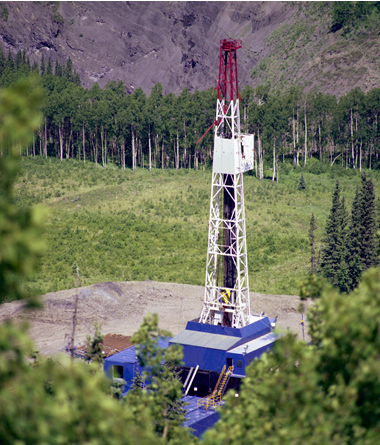 Home » Oil and Gas » So, you want to invest in a natural gas well? 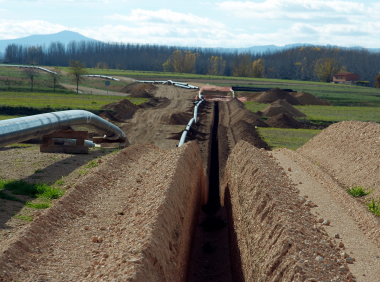 So, you want to invest in a natural gas well? Important things to consider from Kenny DuBose, petroleum engineer and registered investment advisor. "Why did this deal come my way?" One should always make peace with why a project demanding highly engineered analysis – technical, economic, geological, and mechanical – is looking to the man on the street for money. Image copyright iStockphoto / Westphalia. If you're the recipient of an oil and gas royalty check, your familiarity with the industry may prompt you to ask if there's money to be made in direct participation in drilling oil and gas wells. It's not uncommon for oil or natural gas drilling proposals to end up on the desk of non-industry laymen. Direct participation can be lucrative, but caution is the watchword when entering the world of drilling oil and gas wells. This article explains how to be wise in this arena. If you're considering participating in drilling a well, read on for further understanding of the risks (and rewards)!? "Why did this deal come my way?" "Why did this deal come my way?" This is a question of primary importance. It speaks to a significant underlying issue regarding any capital intensive project - the issue of matching appropriate capital with the venture. Appropriate capital comes from investors educated in the art of the deal who understand the legal and technical issues at play, and are able to evaluate the risks properly, AND who can afford total loss of capital. Make no mistake about it; drilling oil and natural gas wells is an extremely risky proposition - not for the faint of heart. "Oil men go to Vegas to calm their nerves" is no overstatement. Thus, while there are a handful of legitimate answers to this question, one should always make peace with why a project demanding highly engineered analysis - technical, economic, geological, and mechanical - is looking to the man on the street for money. Sometimes, it's because industry experienced people don't see it as an attractive proposition. Thus it finds its way to the country club crowd, seeking takers who may not evaluate the risks with rigor. In fairness, the answer may simply be that one has ample capital to allocate to riskier ventures, and as such, oil deals fit the bill. If so, so be it. One can get very well, very quickly in a soundly executed play (oilfield lingo for drilling projects). So, having considered both sides of the coin, let's look over some of the risks. Simply put, this should rank first in line of the judgment calls one must make. Not enough ink can cover the topic of confirming the honesty, integrity, professional ability, and history of the people managing the deal. Is the proposed operator of the well an experienced operator; has he operated in the area; is there extraordinary environmental exposure; is the company financially sound; is proper insurance in place? Is he putting hard cash in the project? You've got plenty of additional risks ahead. The last thing you need are questionable characters at the helm. 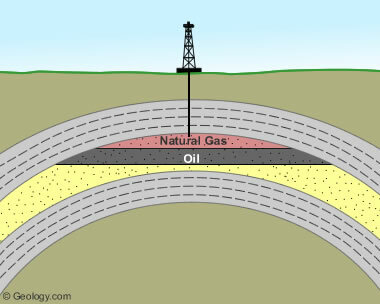 Oil and gas reservoir: This illustration is typical of how an oil and gas reservoir is shown in a science textbook. Although it shows the concept correctly, reservoirs are always a lot deeper than this one and that makes them hard to find, hard to hit and difficult to develop. Drilling a hole in the earth thousands of feet deep, cementing steel casing in it, perforating it precisely in the right spot and outfitting it to bring that precious hydrocarbon to the surface is no walk in the park. Drilling a hole in the earth thousands of feet deep, cementing steel casing in it, perforating it precisely in the right spot (err. not where the salt water is), and outfitting it to bring that precious hydrocarbon to the surface is no walk in the park. Sure it's done every day, but often with expensive hiccups along the way. A poor cementing job can allow channeling of oil, natural gas or water behind the casing, instead of inside where it belongs. Sometimes reservoir attributes demand sand screens, and even specialized chemicals, which often aren't friendly to steel pipe - especially when combined with temperatures exceeding 200 degrees Fahrenheit. In short, there is plenty that can go wrong mechanically between the start of drilling and putting the first check in the bank. Reality is that the layman has no way to mitigate mechanical risk once the project is underway. You'll be relying on the expertise of the operator and his chosen drilling contractor. Natural gas pipeline: A spectacular gas well in an isolated area might not put immediate cash into your pocket. The gas must have a way to market. Lots of gas wells are "waiting on pipeline" for months or years. Building a pipeline requires investors, skilled workers, equipment, good weather and right-of-way negotiations for every property that it crosses. Image copyright iStockphoto / Asterix0597. The size (and producing characteristics) of the reservoir you tap into has a LOT to do with whether or not a project ultimately makes economic sense. If you've put a straw into an oil or natural gas reservoir the size of your backyard pool, well. you get the picture. Remember, this is an oil deal - you're looking for a greater than 5 to 1, and hopefully a 20 to 1 payoff. The point to understand is that recoverable reserves can and do vary widely, the determination dependent upon educated guesses - well control, seismic evaluation, and the area's historical production to name a few. This evaluation can be open to interpretation, especially if there are conflicting opinions among the investors about the results of the analyses. Some may get cold feet and drop out; leaving you a holding a heavier price tag than you initially bargained for. Thus, striking an oil or gas reservoir does not an oilman make. It's got to be of sufficient size to matter. OK, let's say you've been fortunate enough to strike black gold or some of that clean burning natural gas. Now, it must be sold. Raw hydrocarbons are commodity products - meaning you'll sell yours at exactly what the market will bear - no more, no less. As with all commodities, numerous factors go into determining their value, all of which you have no control over. The simple thing to remember is that you (nor the company operating your well) have any meaningful influence on the price at which you sell your product. Reasoned forecasts are the best you can do unless a price hedge has been put in place. Are you able to manage yourself, that is your internal emotions? A drilling project often demands decisions from you along the way. For instance: Do you agree to set casing on the well? This is usually the first and most fundamental of questions. You are making a call as to the estimated productivity of the well - electing either to continue spending more money to complete the well, or declaring it a duster. Other possible emotional strains can come in the form of decisions about going forward in light of lost items in the hole requiring expensive "fishing" procedures, or "squeeze" jobs to cut off unwanted water, or long waits for pipeline hookups, or. - you get the picture. Bottom line - go in with your eyes open. Be sure you understand the scope of decisions you may have to make. Assuming all the planets have aligned thus far, take a hard look at the specific terms of the deal. How much of your entry capital is going to direct costs - is this clearly determinable? Who and to what extent are others getting "carried" (i.e. carried along as a participant without any obligation to put their money in the deal). Is the difference in your NRI (net revenue interest) and your WI (working interest) reasonable? Remember, all the paying partners have to bear their portion of the royalty paid to the landowner - he's carried cost-free in the deal (after all, it's his oil or natural gas you're after). Read the Operating Agreement (that should be provided you), which addresses ongoing operational terms, should you be successful. Is the monthly management fee reasonable? You'll (hopefully) be paying it for a long time. And, don't forget to consider how this project might affect your tax situation. Finally, take a look at the other participants in the deal. Little speaks louder than a sponsor's money invested on similar terms as yours. There is no doubt that the U.S. provides opportunity for the layman to transform himself into an "oilman". And, there are reputable operators who are more than willing to let you join them. There are risks aplenty, but if you've got the stomach and the cash to play, you too might join in a few verses of "Ole Jed's a Millionaire".